“The Ferrari Club” tells the story of the ficticious character Arnie Fortune, a NYU grad student and aspiring musician who becomes a successful Nashville songwriter via the Federal Witness Protection Program. Arnie is swept up in an extraordinary cast of characters including Sam Solstice, a Ferrari driving, womanizing record producer, and the sultry, hot-tempered songstress, Stefany Simmons whose past holds a dark secret which threatens to doom their fiery relationship. 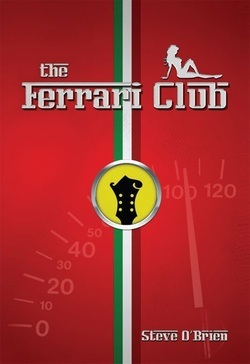 The Ferrari Club is a raucous, no holds barred, romp through the contemporary music business, written by an industry insider and packed with details about what it's like to actually be there. The critics are in total agreement and the book is consistanly given five stars by all reviewers. Amazon book reviewer DB Hooper says, "Steve O'Brien's first entry into the world of authorship is a good one. The Ferrari Club has just enough 'inside' music industry techo-speak without getting too deep into the mechanics of it all. Steve is obviously well versed in any number of things - which translates into a well written and believable story that covers a lot of territory. The main character, Arnie Fortune, is a fantastically lucky guy, but he keeps his humility and 'every-man sensibility throughout a series of exceptional events. The final plot twists are fast and furious and the reader is brought to a final chapter that leaves the door open for round two." While Phil Sweetland of the New York Times says "The fast-paced story combines O’Brien’s inside knowledge of the music and record businesses with another lifelong passion — fast cars. This unique combination quickly shifts into overdrive in a tale that will not only delight readers but could attract the attention of Hollywood producers as well." We'll leave it up to our readers to determine how much of this fascinating story is fiction and how much could be fact. The key character becomes a Nashville songwriter via the "Federal Witness Protection Program"... you have to admit, just that little bit of info makes for an intriguing story. If you have read the book, tell us what you think about it. 2/3 of our staff feels it is a great stocking stuffer so we have provided some links where you can purchase the book, in paperback or for your Kindle. About the author: Steve O'Brien is a Nashville songwriter whose songs have sold over ten million copies. His compositions include the Brooks & Dunn classic hit “Rock My World (Little Country Girl)” and “Here Comes The G-Man”, which was used as a theme song on the G. Gordon Liddy radio show. Steve has had additional songs recorded by platinum-selling singers John Michael Montgomery, Don Williams and Larry Stewart, and his compositions have been performed on network TV shows ranging from Late Night with David Letterman to 48 Hours. Steve’s engineering and producing credits include recordings by Fred Koller, John Hiatt, Kennedy Rose and The Mauldin Brothers.